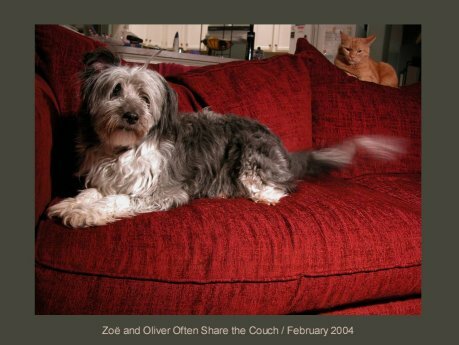 Zoe came to our family through our cat, Oliver (who has his own story; suffice to say that my usually rationalist-atheist husband says Oliver has a "soul.") 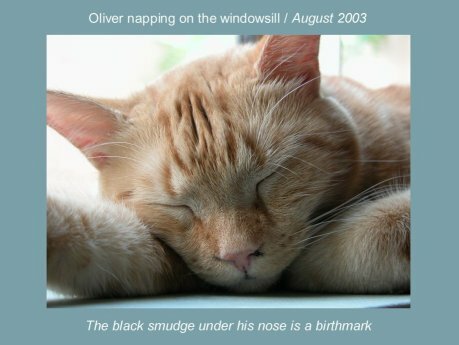 About a year ago, Oliver began favoring one paw, and we took him to the vet to have the paw checked out. While we were at the vet's, she said there was a dog she wanted us to meet, a dog which was recovering from a bobcat attack and whose previous owner had given her up (actually, requested she be put down) rather than pay the vet bill. When we first saw Zoe, her hindquarters were shaved and covered with stitches and puncture wounds. Still, she approached us and allowed us to pet her, touched noses with Oliver, and sat calmly beside him. We decided then and there to adopt Zoe. A few weeks later, when the puncture wounds were closed, Zoe came to live with us. Her wounds healed completely, her fur grew back, and she became a regular companion on our family hikes through the desert (we live in Tucson, Arizona). We quickly became smitten with her pluck and enthusiasm, her sensitivity to our needs and moods, and her sweet and affectionate nature. She knows what it means when I grab my hiking boots; and the slightest tinkling of her leash sends her bounding up and down with excitement. 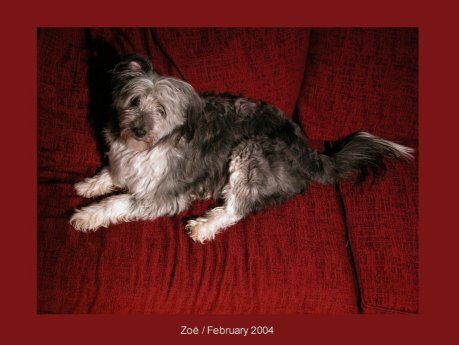 We didn't know Zoe was a Tibetan Terrier (we thought she was a mutt) until another TT owner set us straight a month ago. Since then, I have researched the breed, and feel we have been fantastically fortunate to wind up with a dog with such a marvelous personality and--it now appears--history.